Ranger passed away suddenly and unexpectedly the morning of November 18, 2017. His absence leaves a hole that may never be filled. You set the bar too high, my friend. Ranger has 107 points in NALC Treeing, 41 points in NALC Conformation, 48 points in NALC B-Bay, 4 points in CHDA A-Bay, 160 points toward UGWPCH, 1 jump toward his UNJ title, and 12 runs toward his Coursing Aptitude Supreme title. Ranger has titles or points/scores in every event he has competed in without exception. Ranger retired from NALC B-Bay after winning the 2016 Nationals Trial Belt Buckle. He retires one 1st place short of his B-bay Champion. Ranger completed all the requirements for NALC Show champion title except he lacked the Best/Reserve Best Male in Show. Red leopard with buff trim, Irish spotting. Eyes: R/yellow L/yellow with a blue crack. I thank Tori Earls and Justin Starnes at J Cross Catahoulas for allowing Ranger to come join my crew. He is the greatest dog I’ve had the honor of owning. He never ceases to amaze me with his ability and enthusiasm to try whatever I ask him to do. He is a little dog with a big heart. He will take a beating and not back down. He gives me everything he has every time I ask him to. Ranger is a very vocal and intense tree dog. He has a distinctive loud, sharp, rapid-fire voice. He has an excellent nose and insane amounts of drive. He has no trouble in competition or when finding and treeing game in the woods. He is a medium range dog and does not open on track. Ranger spent the summer of 2010 at Cross Check Catahoulas and developed his own style while working cattle, as well as built up his confidence for working in general. He was introduced to bay pen competition in November 2010 and showed that his up-close-and-personal style makes him a good bay pen competitor. Ranger spent the winter of 2011-2012 at J Cross Catahoulas learning the ropes of being a cow dog and hog dog. Ranger completed his UKC Champion title with a Best of Breed win on April 18, 2009 at the age of 9 months, 3 days. He went on to get a Group 4 of 8 breeds in the Herding Group. Ranger earned his UKC United Weight Puller title on December 13, 2009, two days short of 17 months. His best pulls to date in any organization are 2525# (44.298%) on wheels (artificial surface), 1,107# (19.086%) on wheels (natural surface) and 2410# (40.167%) on rails. He has not yet competed on snow. Ranger earned his UKC Conformation Grand Champion title at the UKC Premier on July 11, 2010, four days short of his second birthday and only three days after winning the Best in Breed Top Ten for the 2009 season. UKC Coursing Aptitude title on October 10, 2010. UKC Weight Pull Champion title on June 19, 2011. NWDA Weight Pull 3 title on October 8, 2011. NWDA Weight Pull Champion title on October 9, 2011. NALC Tree Dog Champion title on April 1, 2012. NWDA Weight Pull Grand Champion title on October 20, 2012. NWDA Weight Pull Supreme Grand Champion title on October 21, 2012. UKC Coursing Aptitude Excellent title on June 12, 2014. NALC Champion of Tree Dog Champions on April 26, 2015. 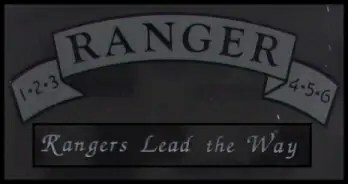 Ranger’s registered name is in tribute to my grandfather who served in the European theater of WWII with the 101st Airborne. Grandpa was one of the strongest people I’ve ever known. 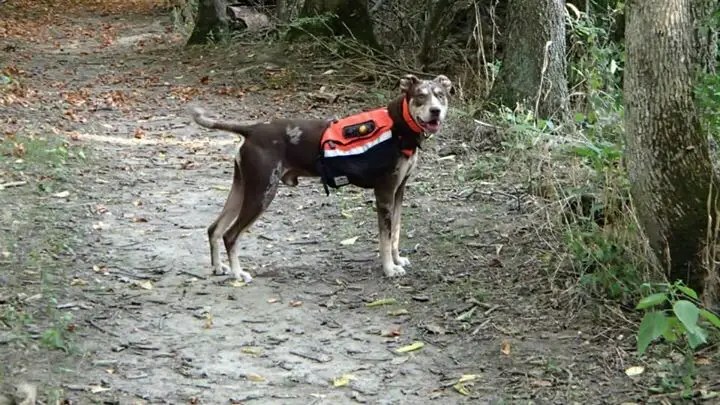 Ranger wears a weight pull harness made by Brown Dog Designs. I highly recommend this harness. Ranger carries a Banzai backpack made by Wolf Packs. This is the best dog pack on the market–period. Ranger’s buckle from winning the 2016 NALC B-bay nationals trial. Ranger treeing at J Cross Catahoulas in 2012. Ranger’s first weight pull, Big Orange Weight Pullers–Jayess, MS, November 2009. Image © 2009 Sandy Yorston. 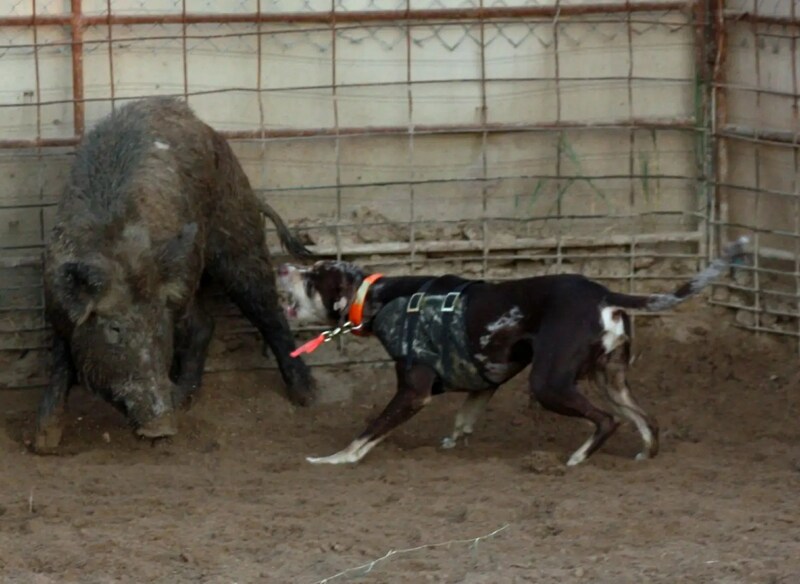 Ranger baying Pee Willy the hog at J Cross Catahoulas, November 2009–Image © 2009 Sandy Yorston. Ranger carrying his backpack on a hike.